Quick Step team has announced a Tour de France team with a mix of experience and talent that will aim for stage wins when the race starts on July 3rd in Rotterdam, The Netherlands. 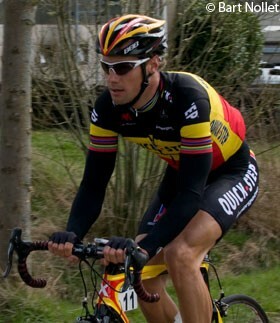 Leading their charge will be Tom Boonen, as he looks to challenge in the sprints to regain the form that saw him take the green jersey in 2007. If Boonen can't start the Tour, then his place will be taken by the team's second sprinter Wouter Weylandt. The young Belgian had been under a lot of pressure from Quick Step boss Patrick Lefevere this year for lack of performance prior to his surprise stage three win in the Giro d'Italia last month. Quick Step will take the opportunity to debut several riders in this year's Tour de France, and chief among them being young Belgian Kevin Seeldraeyers, the best young rider from last year's Giro d'Italia. The young climber will be the team's sole general classification rider, but will take the start without the pressure of being a team leader. He will ride alongside compatriots Dries Devenyns, Kevin De Weert and Maarten Wynants, who will also be riding their maiden Tour. Belgium's top team will round out their Tour de France team with the triple threat of Frenchmen Sylvain Chavanel and Jérôme Pineau and Spaniard Carlos Barredo. Chavanel's has had a lackluster season by his standards that was complicated by a skull fracture in Liège-Bastogne-Liège as he was poised to turn things around. The Frenchman came close to victory in last year's Tour de France on the thirteenth stage to Colmar, but faltered in the final kilometers as Heinrich Haussler (Cervelo TestTeam) rode on to victory. He will be highly motivated to perform in his home Tour and re-solidify his place on the team. Fellow Frenchman Pineau will be starting the Tour following a strong performance in the Giro d'Italia that saw him win stage five and finish third in stage twelve. Barredo, winner of the Clásica de San Sebastián in 2009, showed good form in the Tour of California last month. Both riders will be a threat for stage wins.